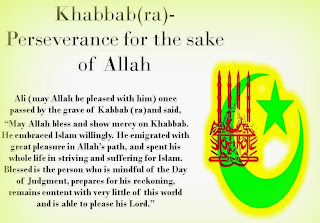 Khabbab RA is also one of those blessed persons who offered themselves for sacrifice and suffering for the cause of Allah SWT. He was the sixth or seventh person to embrace Islam, and therefore, he suffered long. He was made to put on steel armor and lie in the sun to sweat and swelter. Very often he was made to lie flat on burning sand, which caused the flesh on his back to waste away. He was the slave of a woman. When she came to know that he was visiting Nabi SAW, she used to brand his head with a hot iron rod. Saidina Umar RA, during his caliphate, once inquired from Khabbab RA about the details of his sufferings after embracing Islam. He showed him his back, on seeing which, Saidina 'Umar RA remarked, "I have never seen such a back before." He said, "My body was dragged over heaps of burning charcoal, and the blood and fat coming out of my back put out the fire." It is said that, when Islam spread and the Muslims conquered all the surrounding territory, he used to weep and say: "Allah seems to be compensating us in this world for all our sufferings and perhaps nothing would be left for us as reward in the Hereafter." 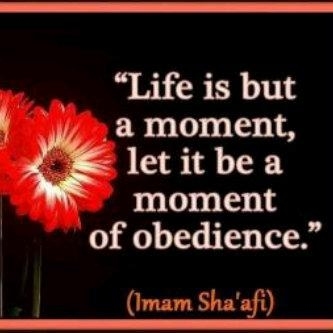 contented with very little of this world and is able to please his Lord." To be able to please Allah SWT , was really the Sahabah's greatest achievement, for this was the sole purpose of their life. Allahu akbar!!! How about the 80,000 Dirham? please read further about the early life of Khabab Ibn Aratt RA. A woman named Umm Anmaar who belonged to the Khuza-a tribe in Makkah went to the slave market in the city. She wanted to buy herself a youth for her domestic chores and to exploit his labor for economic gains. As she scrutinized the faces of those who were displayed for sale, her eyes fell ON a boy who was obviously not yet in his teens. She saw that he was strong and healthy and that there were clear signs of intelligence on his face. She needed no further incentive to purchase him. She paid and walked away with her new acquisition. Umm Anmaar placed the youth as an apprentice to one of the blacksmiths in Makkah to learn the art of making swords. The youth learn quickly and was soon an expert at the profession. When he was strong enough, Umm Anmaar set up a workshop for him with all the necessary tools and equipment from making swords. Before long he was quite famous in Makkah for his excellent craftsmanship. People also liked dealing with him because of his honesty and integrity. Umm Anmaar gained much profit through him and exploited his talents to the full. “After this night of darkness, there must be a dawn.” And he hoped that he would live long enough to see the darkness dissipate with the steady glow and brightness of new light. Khabbab did not have to wait long. He was privileged to be in Makkah when the first rays of the light of Islam penetrated the city. 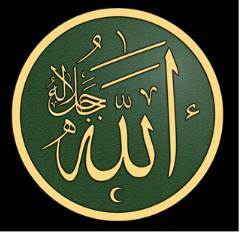 It emanated from the lips of Muhammad ibn Abdullah -Rasulullah SAW as he announced that none deserves to be worshiped or adored except the Creator and Sustainer of the universe. He called for an end to injustice and oppression and sharply criticized the practices of the rich in accumulating wealth at the expense of the poor and the outcast. He denounced aristocratic privileges and attitudes and called for a new order based on respect for human dignity and compassion for the underprivileged including orphans, wayfarers and the needy. To Khabbab, the teachings of Muhammad were like a powerful light dispelling the darkness of ignorance. He went and listened to these teachings directly from him. 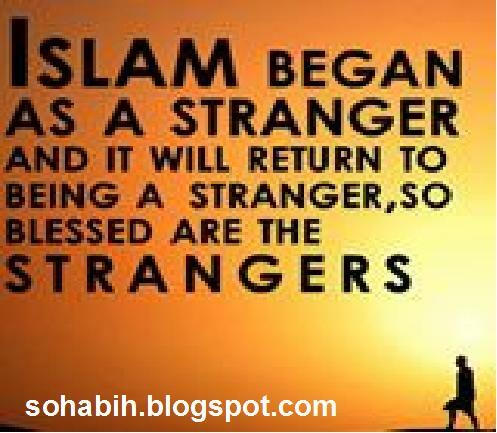 Without any hesitation he stretched out his hand to the Prophet in allegiance and testified that “There is no god but Allah and Muhammad is His servant and His messenger.” He was among the first ten persons to accept Islam . “What is it?” asked Khabbab RA. No sooner had Khabbab RA spoken these words than Sibaa and his gang set upon him. They beat him with their fists and with iron bars and they kicked him until he fell unconscious to the ground, with blood streaming from the wounds he received.The news of what happened between Khabbab RA and his slave mistress spread throughout Makkah like wild-fire. People were astonished at frankness of Khabbab’s . They had not yet heard of anyone who followed Muhammad SAW and who had the audacity to announce the fact with such frankness and deviant confidence. The Khabbab RA affair shook the leaders of the Quraysh. They did not expect that a blacksmith, such as belonged to Umm Anmaar and who had no clan in Makkah to protect him and no asabiyyah to prevent him from injury, would be bold enough to go outside her authority, denounce her gods and reject the religion of her forefathers. They realized that this was only the beginning . . The Quraysh were not wrong in their expectations. Khabbab’s RA courage impressed many of his friends and encouraged them to announce their acceptance of Islam. One after another, they began to proclaim publicly the message of truth. In the precincts of the Haram, near the Kabah, the Quraysh leaders gathered to discuss the problem of Muhammad SAW. Among them were Abu Sufyan ibn Harb, al Walid ibn al-Mughira and Abu Jahl ibn Hisham. 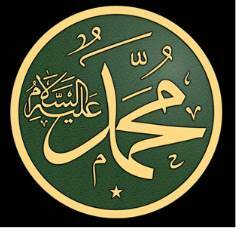 They noted that Muhammad was getting stronger and that his following was increasing day by day, indeed hour by hour. To them this was like a terrible disease and they made up their minds to stop it before it got out of control. They decided that each tribe should get hold of any follower of Rasulullah SAW among them and punish him until he either recants his faith or dies. This enraged them even more and they would take a big hot stone and place it on his back. Khabbab’s RA pain and anguish would be excruciating but he did not recant. The inhumanity of Umm Anmaar towards Khabbab was not less than that of her brother. Once she saw the Prophet SAW speaking to Khabbab RA at his workshop and she flew into a blind rage. Every day after that, for several days, she went to Khabbab’s RA workshop and punished him by placing a red hot iron from the furnace on his head. The agony was unbearable and he often fainted. 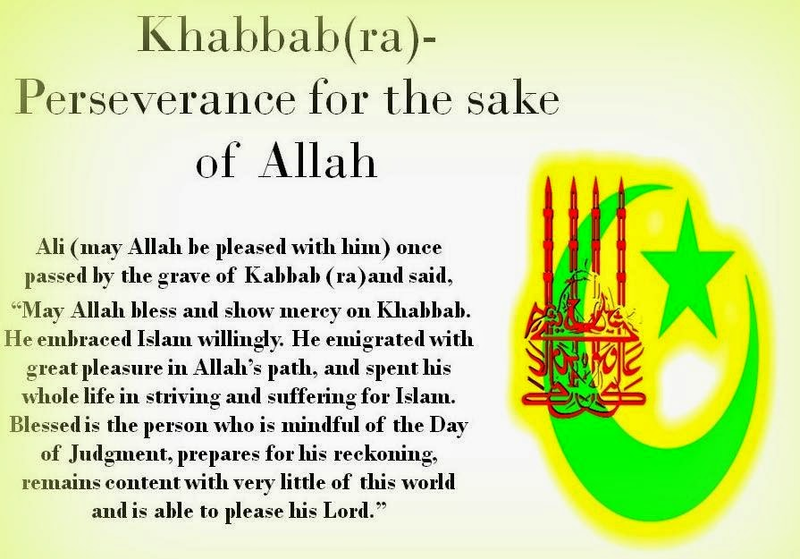 Khabbab RA suffered long and his only recourse was to prayer. He prayed for the punishment of Umm Anmaar and her brother. His release from pain and suffering only came when the Prophet SAW, peace be upon him, gave permission to his companions to emigrate to Madinah. Umm Anmaar by then could not prevent him from going. She herself became afflicted with a terrible illness which no one had heard of before. She behaved as if she had suffered a rabid attack. The headaches she had were especially nerve-racking. Her children sought everywhere for medical help until finally they were told that the only cure was to cauterize her head. This was done. The treatment, with a ret hot iron, was more terrible than all the headaches she suffered. At Madinah, among the generous and hospitable Ansar, Khabbab RA experienced a state of ease and restfulness which he had not known for a long time. He was delighted to be near the Prophet SAW, with no one to molest him or disturb his happiness. He fought alongside the noble Prophet at the battle of Badr. He participated in the battle of Uhud where he had the satisfaction of seeing Sibaa ibn Abd al-Uzza meet his end at the hands of Hamza ibn Abd al-Muttalib RA, the uncle of the Prophet SAW. “No one is more deserving than you to be in this assembly other than Bilal RA.” He asked Khabbab RA about the torture and the persecution he had received at the hands of the mushrikin. Khabbab RA described this in some detail since it was still very vivid in his mind. He then exposed his back and even Umar was aghast at what he saw. In the last phase of his life, Khabbab RA was blessed with wealth such as he had never before dreamed of. He was, however, well-known for his generosity. It is even said that he placed his dirhams and his diners in a part of his house that was known to the poor and the needy. He did not secure this money in any way and those in need would come and take what they needed without seeking any permission or asking any questions. He wept and they asked why he was weeping.